How does political tension affect astronauts aboard the ISS? Tension between the U.S. and Russia on account of the current political situation in the Ukraine has raised questions about the cooperation of Russian and American astronauts aboard the International Space Station – questions NASA chief Charlie Bolden addressed in a news conference held yesterday. I don't think it's an insignificant fact that we're starting to see a number of people with the idea that the International Space Station be nominated for the Nobel Peace Prize. It's not trivial. 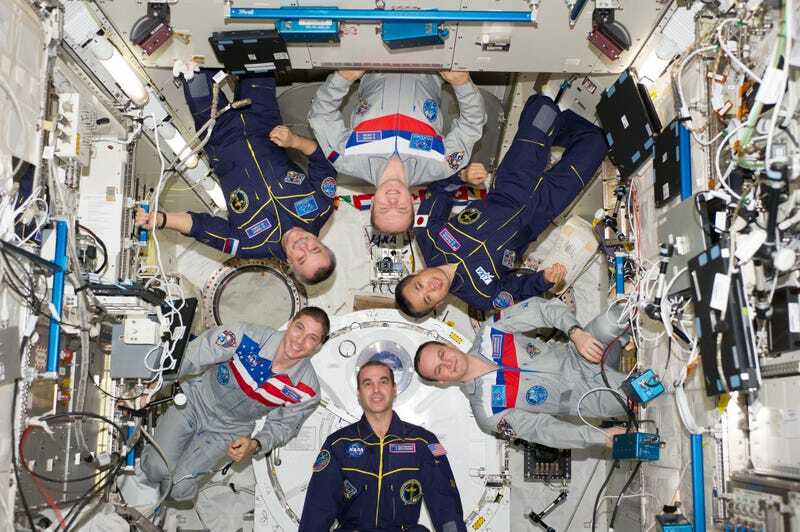 It has continued to exist and continued to function with people from a variety of cultures and beliefs, but we all are focused on the mission of the International Space Station. NASA astronaut Mike Hopkins is slated to return to Earth aboard a Russian Soyuz spacecraft on March 10 in the company of Russian cosmonauts Oleg Kotov and Sergey Ryazanskiy. According to SPACE.com, "NASA officials are confident that the landing will not be affected by the current political climate." We're inclined to believe in space farers' ability to separate their endeavors in low-Earth orbit from ongoings here on Earth. Seeing Earth from a distance, after all, has been known to inspire a powerful sort of "global consciousness."